Venezuela’s Adjunct Ambassador to the United Nations, Julio Escalona writes: The military-financial complex that rules the world has been strengthened in detriment to the real economy. For that reason the US economy hegemonizing transnationalization is not based on savings, investment and production linked to a distribution of wealth that offers greater levels of employment and welfare as the base of social cohesion. Social cohesion is achieved today through media dictatorship that imposes values, a world vision and individual solutions sustained by material success. Fear is the common denominator: against the foreigner with a different skin color, religion, culture, against the poor. Exclusion that denies democracy and legitimizes violence. It has led to a revitalization of slavery, including sexual trafficking of million of women and children and super-exploitation of nature that grows with the assignation of prices on eco-systems, biological diversity and knowledge of aboriginal civilizations. To sustain this framework of violence for the first time in history a military-world block has been set up with ramifications on all continents directed by the Pentagon through NATO of which the military bases in Colombia, Costa Rica and around a thousand military bases on the planet are part and parcel. This militarization is combined with IMF policies that reduce social expenditure and the destruction of public space guaranteeing that banks recover loans while weakening social movements. 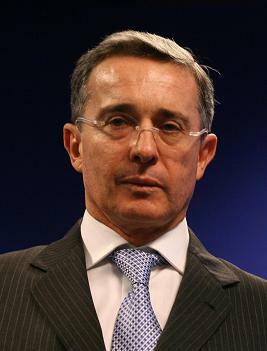 Uribe and the governments of Colombia are part of that network which militarizes international relations. President Chavez has pointed out that this contrasts with Venezuela’s efforts to establish a society of peace founded on justice and with Uribe’s initiatives to extend transnational violence to sabotage peace efforts. Among other measures, the key to neutralize those threats is a Colombia-Venezuela commission on presidential level to monitor the borders, dismantle narco-paramilitary networks, regulate the flow of refugees, and avoid the penetration of regular or irregular forces. Just look at the media manipulations launched from Colombia. H.E. Ambassador Julio Escalona ([email protected]) is Venezuela’s Adjunct Ambassador to the United Nations in New York. He holds degrees in economics, geopolitics and environmental issues, and is a former director of the School of Economics at the Universidad Central de Venezuela (UCV) in Caracas and head of its department of human development. He is a professor of economics, general economic history, economic education in Latin America, contemporary Marxism and contemporary social problems. He has coordinated research seminars on economic integration, local economies and local development, and alternative technologies and has been a participant and guest lecturer at seminars, forums, academic institutions in Peru, Brazil, Japan, Paris, Mexico and Venezuela.